When temperatures soar, who better than a weather company to control your thermostat? The mercury has just started to rise across the country, but utilities and system operators have already started to plan to cut down on peak demand. In Texas, this summer is expected to be nearly as hot as last summer, when excessive temperatures led to record-breaking energy use. To combat the weather, CenterPoint has turned to a company that knows a little something about weather: Earth Networks, which owns WeatherBug. WeatherBug first launched its Smart Grid Solutions in 2010, but there hasn’t been much noise since then. 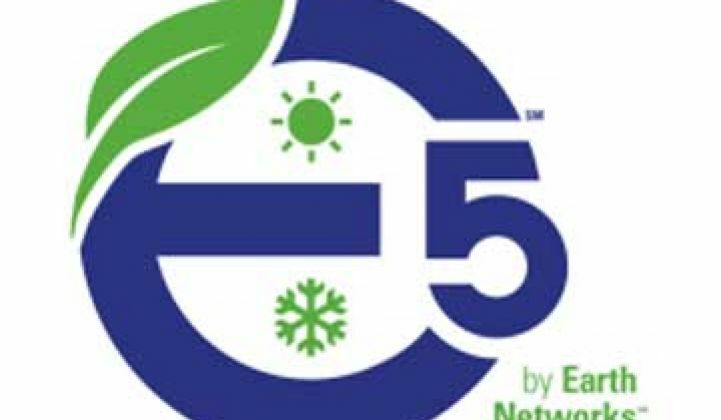 Earth Networks, which has teamed up with EnergyHub, has just released the first offering of its e5 program. The program will be made available for CenterPoint customers who are looking to save money this summer, and will also provide some demand response relief to the utility. CenterPoint’s Houston-area customers who already have 3M wireless thermostats (which all come equipped with EnergyHub’s Mercury platform) will be able to sign up for the service for free. The first 2,500 will receive a $25 Home Depot gift card for participation. Those who don’t have 3M thermostats will be offered the devices at a 15 percent discount. The e5 software does not displace EnergyHub’s service, but rather runs on top of it. The software leverages WeatherBug’s network of ground sensors and data from the thermostats, along with home and smart meter data to build a thermal dynamic picture of each house. Consumers who opt in to the program pick their comfort settings so that the temperature never goes above or below the home owner’s stated parameters. The weather stations provide 29 variables, and there are another 12 variables that are taken into account for the house, including how long it takes for the sun to penetrate through the walls or how long it takes for the energy in the air to translate into thermal mass. “We haven’t come across a house we can’t optimize yet,” said Dave Oberholzer, director of energy products and business development at Earth Networks, which has been working with the University of Maryland to refine its algorithms. If the service sounds similar to EcoFactor, it is. One key difference is that WeatherBug’s e5 is always free for the customer and Earth Networks is leveraging its core business of weather data. Also, instead of making various micro-adjustments throughout the day, e5 is mostly concerned with hitting the right temperatures at the right time. If customers want it to be 72 degrees when they walk in the door at 5:30 p.m., e5 will ensure the house is at that temperature within one or two degrees within five minutes of the set time. The average savings for each house is about 15 percent, although it can be as high as 30 percent, according to Oberholzer. Many of the other behavioral pushes will still come from EnergyHub’s platform. The program will deliver about 2 megawatts overall in demand reduction -- a drop in the bucket when you consider that the entire Texas power grid hit a peak of 68,294 MW last summer. The demand reduction is equal to what might be achieved from one commercial customer, although the untapped market for residential peak shaving also means this is just the tip of the iceberg. E5 will also provide an energy scorecard to customers at the end of summer. Instead of just telling you how you compare to your neighbors overall, it will specify how your home does in areas such as wind and solar infiltration. Think of it as a rating system for the home itself. With smart meter data, it can also offer the data in terms of kilowatt-hours or dollars. “On a gross level, we can tell if you have an air infiltration problem,” said Oberholzer. But it can’t tell you which door or window is leaky. For that, homeowners will have to choose to take the next step. The data will never be sold to third parties, but CenterPoint Energy has the opportunity to offer energy audits for homes that are underperforming. For companies like EnergyHub and WeatherBug, the power is in numbers. As more wireless connected thermostats are in the homes, utilities can leverage those for some peak relief during summer.